We’ve all been there. You create a lengthy email that mentions something personal about a fellow employee, relative, friend, roommate, …you name it… and the second you hit SEND you realize it went to the wrong address. How about the time you emailed your tax information to your accountant and he never received it? Then there’s the one about the client waiting for a contract to be sent over and you send an email titled “Here it is!” with nothing attached? Ever see something like this in your inbox? Either the email is leaving you in suspense on purpose or the sender contracted “I didn’t mean to send that!” syndrome. Incomplete emails like this happen because a demented programmer at Microsoft thought Ctrl-Enter would be a good shortcut for the Send command in any of its email applications. If you type 643 characters per minute like I do, that means pasting a link into a message with Ctrl-V and then hitting Enter has to be perfectly timed. If “Enter” makes it to the finish line first, you’re going to end up cursing a lot and having to send another email. This is easily prevented by leaving the To: field blank until your email is completed. Compose your masterpiece, correct your spelling mistakes, make all those grammar corrections, add your links, and resist the temptation to pop open your Contacts list until everything is ready. It’s like putting a safety on your Send button to remind you to double check everything. Without an address, accidentally sending a message saying “Meat me for lunch” will never happen. 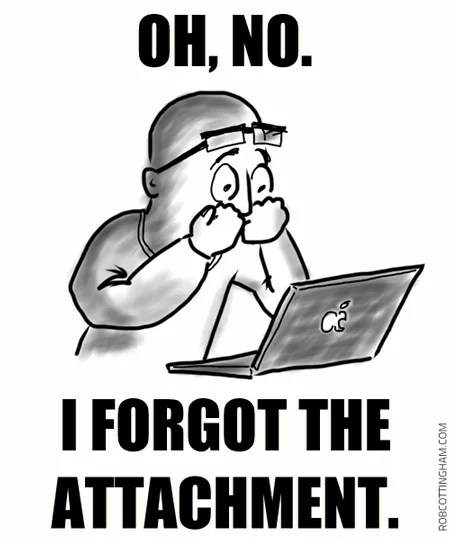 Before you get too distracted, put your attachments in first and there’s no chance of forgetting. Everyone exchanges email addresses, and they’re only written down accurately 78.2% of the time (I did my own personal survey). If I tell someone my address is dailyslice@toast.net, I’ll inevitably get reports back of difficulty sending to dailyslice@toastnet.com, dailyslice@toast.com, and my favorite: dailyslice@toast.net.com (There’s always an urge to shove that .com in there for some reason.). Before sending something important to a new email address, send a “feeler” email. Something along the lines of “Hi! I’m going to send some things over to you shortly, just wanted to let you know!” If you get a response back, the account is valid and ready to use. If you don’t hear back, a quick phone call to verify the address would be a good idea. Or it will confirm the person is ignoring you. Either way, a phone call will clear up your next course of action. 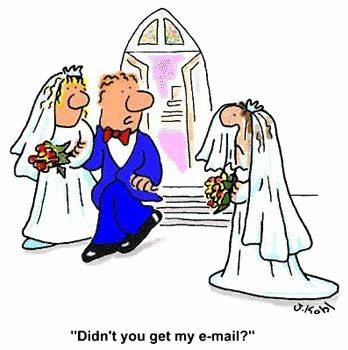 If someone calls you and says “I never got your email.”, don’t just say “OK, I’ll resend it!”. Believe it or not, there is no magical email troll that wanders the Internet randomly eating messages. If a message is not received the first time, you need to find what caused the failure. Verify the email address you’re using letter by letter or have the recipient send you a message and see if you can reply. Watch for any “bounce” messages (messages returned to you by the mail server). These messages will have a lot of gobbledygook in them, but at the bottom is usually a nugget of information. Look for things like “Error 554: The Message Was Rejected by the Recipient’s mail server…” or “Error 550: mailbox is not available…”. These errors will give a clue as to what’s happening. You can try forwarding the message to your email provider or administrator to help decipher it if it is too cryptic. Auto-complete is designed to make your life easier. Your Contacts list most likely uses it so you don’t have to scroll through all 25,000 contacts that all you popular people keep. It’s also waiting to take you down. If you simply type in Brian in your To: field, it will auto-complete Brian’s address…but as to WHICH Brian is totally random. It might be Brian C., it might be Brian G., it might be Brian W., and God help you if you have Brians with last names that start with the same letter. One mis-click and you’re done. If you fall into this trap I think auto-complete even adds “Ha ha!” to the email’s header information. Don’t become a victim. Double check anything that auto-complete tries to pass off on you. We all need to send attachments from time to time. You have to be reasonable though — don’t try sending a 52MB PowerPoint presentation and act surprised when your colleague says he didn’t get it. TOAST.net allows you to send a generous 20MB of attachments per message, but most mail providers aren’t that nice. 2MB to 8MB is the normal limit, and I actually consider it rude to send anything over 2MB (there’s nothing like a huge clunker attachment clogging up your mailbox while you’re trying to read something quickly). If you’re sending photos consider shrinking them down to a lower resolution, or use a photo sharing service so you only have to send a link. TOAST.net’s mail allows for direct document sharing, so this could be used to get around file size limitations all together. If you really need to send something gigantic consider one of the many free file sharing services like YouSendIt. Manually typing a link in your email can result in misspellings, which results in a broken link or your boss being unintentionally directed to a much more interesting site than intended. The http://www.whitehouse.gov vs. http://www.whitehouse.ANYTHING ELSE fiasco is the most famous example of this, and many other typo pitfalls await you. Those interesting sites capitalize in people misspelling popular internet destinations, and they get rich doing it. Utilize the extra tabs in your web browser and actually browse to the site you want to send. Then simply copy the address from your browser’s address bar and paste it into your email. Better for you to mistype something in your browser that makes you scream “HOLY COW HOW IS THAT PHYSICALLY POSSIBLE???!! !” than having your boss endure the wrath of your fat fingers. These quick tips will transform you from an email ignoramus to a messaging matador in short order. If you have any other tips I may have missed, don’t just sit there– reply away! His cake is four times as big as mine.It’s going too far.I am a football fan.The secret was spread among the crowd.she has been cranky all day.I go to school by bike every day.I go to school by bike every day.No way!A wet road is usually slippery.How did the game turn out?